The State Board of Education approved school A-F grades for the 2016-2017 school year Wednesday. It reports an increase in the number of schools receiving As and fewer receiving Bs. Yet the overall percent of schools that received As and Bs is the nearly the same as last year. State Superintendent Jeniffer McCormick warned that “celebrating” the continued high number of top tier schools would be premature. Next year Indiana schools will face a change in accountability due to new federal education policy. 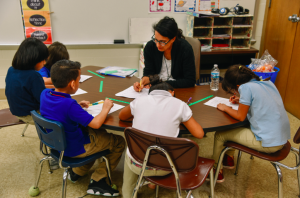 A-F grades for schools are mainly calculated using a students’ academic growth on the ISTEP exam from year-to-year. Other factors include how many students passed state assessments and graduation rates for high schools. In all 620 schools, or nearly 30 percent, earned an A. About 16 percent of schools earned a D or F.
Traditional public schools, charter schools are private schools that accept state-funded vouchers from the Choice Scholarship program are required to receive an accountability grade. Of the 69 charter schools receiving a grade, nearly 33 percent earned A or B, and 34 precent earned a D or F.